I’m finding it increasingly difficult to get motivated to go to the allotment on cold autumn or winter days but, having consumed the last of this year’s frozen broad beans and, as we are approaching the sowing season for 2016, a visit is a must. This year I had a reasonable crop of broad beans and they are one of the few vegetables that freeze successfully. Fortunately we had a dry sunny day on Tuesday and I was happy to spend an hour tidying and preparing the ground. and lift the first of the Jerusalem artichokes. And surprise, surprise the raspberries were still fruiting! (although very much past their best). My problem with the raspberries is that they were inherited and are a mixture of summer and autumn fruiting varieties and in our changeable climate it’s difficult to tell them apart and this could be a problem when it comes to pruning. I have been advised that the old canes on autumn varieties need to be removed and new ones should emerge next year, whereas with summer fruiting varieties the fruits should appear on the canes that have already grown this year. I will see if I can determine which is which and report back on my success, or lack of it, next year. My priority was to clear one of the raised beds in preparation for sowing some broad beans later this month. I will sow two double rows - eight inches apart with two feet between the double rows, one of Aqualdulce and one of Sutton’s dwarf variety. I find these varieties do well for autumn sowing. I will sow more, possibly other varieties, from February/March onwards. The November sowings will crop only a week or two ahead of the Feb/March sowings but (hopefully) might be early enough to avoid the inevitable blackfly infestation! I will also feel good that something is actually growing over winter. I also turned my thoughts to runner beans which will probably not be sown or planted out until May but it is advisable to prepare the ground. Runner beans need a lot of moisture and nutritious soil. I usually dig two trenches about 1 foot deep and 18 inches wide and 2 -3 feet apart – this is where the beans will be sown. I pile the soil dug out on each side of the trenches. Having dug the trench, I lightly fork the bottom and then fill with organic matter – in my case kitchen waste, peelings etc and any other compostable material which will aid water retention, including torn up newspapers mixed in with the kitchen waste. 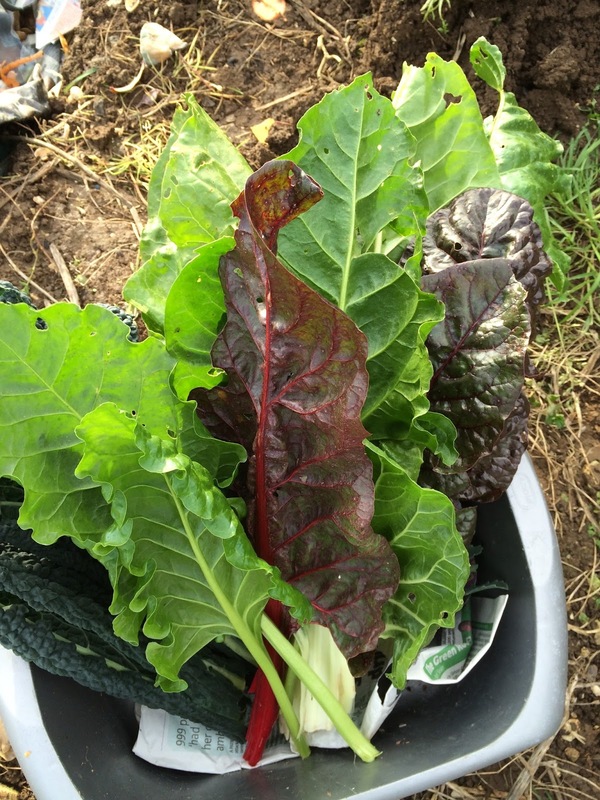 I also have a 3 tier wormery and will add some of the partially rotted compost from this and some of the “worm Juice”, liquid manure that collects at the bottom, and this will aid the composting process. I then leave the trenches open during the winter until Feb/March before returning the soil in readiness for planting. 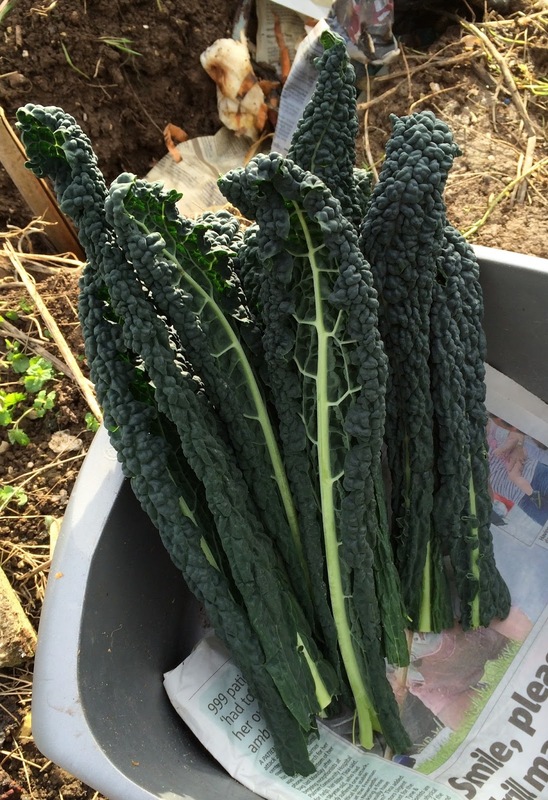 I have only managed one trench, so will have to go back later this week or next (if the rain stops) for the second trench– but the good news (which will encourage me to visit) is that there is still lots of cavolo nero and chard to harvest and the leeks are looking good too.